Where else can you get this kind a guaranteed return on investments? Stocks carry investment risk and cash-equivalents are very unlikely to keep pace with inflation. If you were born in 1943 or later, for every month you can defer drawing social security between your full retirement age and 70, you earn a ‘delayed retirement credit’ of 2/3rds of 1 percent – that’s the 8% per year. Filing too early for retirement means your benefits might be reduced as much as 30%. For example: Let’s say you’re a healthy 62 year old and you are set to earn a benefit of $1,000/month at your full retirement age of 66. By choosing to withdraw at 62 your benefits are reduced to $750 a month. Delaying until 70 increases them to $1,320 a month. According to the Social Security Administration, one in three 65 year olds today can expect to live to 90. Taking early retirement or delaying until 70 can have a dramatic impact on your benefits. If your spouse is eligible for social security based on your work record (for example, if he/she did not earn enough credits or were lower earners during their career), your decision will also affect their lifetime benefits. There are numerous strategies that could increase your lifetime benefits by tens or even hundreds of thousands of dollars. First understand there are three basic forms of retirement benefits: The Worker Benefit, The Spousal Benefit, and the Survivor Benefit. So, how do you plan for maximizing your benefits and bridging the gap until your optimal withdrawal age? There are multiple considerations: Your health, whether you are married, divorced or single, your willingness and ability to continue working, and the availability of other sources of retirement income. 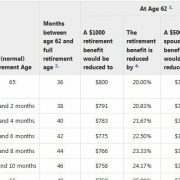 A good (but basic) starting point is the Social Security Administration’s own Retirement Estimatoror other calculators. Quicken 2015 has a new Social Security Optimizer tool (paid) while a variety of paid and free sites offer estimators to varying degrees of effectiveness. We have some sophisticated software that can run advanced social security projections. For many of our clients, the answer isn’t as straightforward as age vs income. We consider all aspects of our clients’ situations and present a variety of scenarios, along with our recommendations. Strategies might include ‘file and suspend’ (more on that in an upcoming blog) and drawing down retirement accounts more aggressively before age 70. The decision – like everything in personal finance – is personal. However, making the right decision can make a substantial difference. Know the rules before making critical decisions. The unknown variable of how long a person will live makes this decision very un-scientific. The latest government statistics show that men alive at age 65 are expected to live to age 82.9; women of the same age are expected to live to 85.5. 3 Reasons to Hire a Fee-Only Financial Planner When Should You Start Saving for College?